Sasha and Lyuba Boichuk watch a stand-up comedy show during the New Years holiday. Lyuba blames the Chernobyl accident for their son's murder, but Sasha blames himself. At the time of the accident, the Boichuks were just starting to build themselves this house in Sukachi, Ukraine. After some hesitation, they kept building and have lived here ever since. Original caption: .Photo title:.New Year's holiday in Sukachi. ..Short caption: .Lyuba Boichuk blames the Chernobyl accident for their son's murder, but her husband Sasha blames himself...Full caption: .Sasha and Lyuba Boichuk watch a stand-up comedy show on TV during the New Years holiday. At the time of the 1986 accident, Sasha and Lyuba were just starting to build themselves this house in Sukachi. 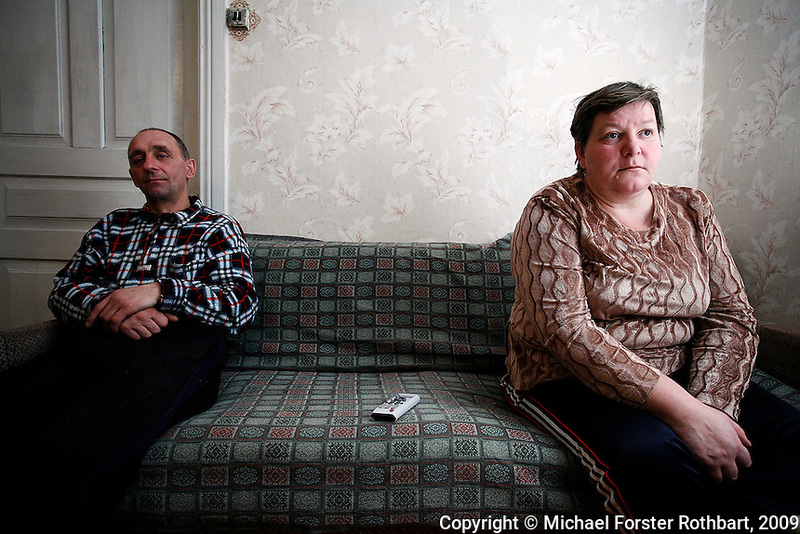 After some hesitation, they decided to continue building and have lived here ever since. . Sasha worked as a liquidator in the Chernobyl clean-up efforts. Afterwards, he began to drink heavily, and says he lost a decade of his life to alcohol. He blames himself for the death of his son, who disappeared outside a local bar and is believed to have been murdered during a robbery. .-------------------.